The MPTL Mendini brass pocket trumpet can be a great choice for beginners, but only in specific instances. It features three mother of pearl inlaid keys, three smooth action valves and a phosphorus copper lead mouth pipe. While it is marketed as a beginner pocket trumpet and a reliable practice instrument for music students, many consumers disagree. This Mendini instrument has a few faults. They may simply be the result of glitches in the production process and poor quality control, or they could indicate a deeper issue like poor product design. Mendini is a fairly new company that produces lower-priced instruments. They are budget friendly but not designed for professional use. With this in mind, keep your expectations to a minimum and really only consider this instrument if you or your child are thinking of taking up this particular brass instrument, but aren’t yet certain that you’d like to pursue it long term. There is a lot of mixed feedback regarding the MPTL’s quality, but the negative feedback comes mainly from experienced players, while the positive feedback comes from parents who purchased this model for their children. It can be just what you’re looking for, as long as you are aware what you’re getting. The Mendini pocket trumpet reviewed here comes with a pair of gloves, a plush-lined hard shell case with a nylon cover, a cleaning cloth, a stand, a tuner and a bottle of valve oil. It also has a one year product warranty against manufacturer defects. The included carrying case is equipped with a strap for added transport ease and comfort. This model is available in six different colors including the traditional gold finish, black, blue, green, nickel and red. The sleek, beautiful design, combined with its rich sound make this a versatile model and one of Mendini’s top selling packages. But don’t let that fool you. It is definitely a reasonably priced model, but most users have issues with the valves, which stick frequently. To remedy this issue, pros recommend polishing and sanding the valves, but this is risky and can damage the instrument if not done correctly, to the point that it can become practically useless. Besides, an instrument marketed toward beginners should not require you to make any kind of modification, let alone one so tricky. Some consumers said they took theirs to a professional for repairs, but that should not be necessary. It is covered by a one year product warranty, so if you get a faulty unit, we encourage you to contact customer service for a replacement model. Since the sluggish valves seem to be caused by the valves being improperly lapped during production, the manufacturer can replace them with good ones. Unfortunately, this will leave you without your instrument for a few weeks. While the sluggish valves were a common complaint beginners felt that the trumpet offered a pretty big sound and they loved how portable it is. Consumers note that the tuner works well and comes with batteries, which is definitely a plus. While it can be a little difficult to get the horn into the carrying case, this type of tight fit works well to protect the instrument from damage during travel. One pro who purchased this model was actually surprised at the tone quality it offered, although we feel it can sound a bit stifled at times. This issue can easily be corrected by purchasing a larger mouthpiece instead of using the stock one that comes with it. Of course, the main issue many users have involves the valves, but others also mention the poor quality of the included stand, stating that it falls over as soon as you put the instrument on it and it is commonly described as wobbly and cheap. One consumer stated that the Mendini MPTL doesn’t offer the best sound, but it was still better than what they were expecting. That’s our take, too. For the price, it’s good, but nothing like a high-quality model. But again, the quality of the valves is the main issue you need to worry about. In addition to the problems while playing, when you take the trumpet apart to oil the valves, it can be incredibly difficult to line them back up again, in some cases taking up to two hours to do so (this is an unusually long time, though). Many consumers also suggest tossing out the mouthpiece that comes with this model. We concur. It is pretty useless. Another consumer reported that the mother of pearl inlays on the buttons had fallen off during shipping. One consumer felt that the biggest problem with this model involved tuning. Actually playing up and down the range will require some serious adjustments to the tuning slides and an adjustment of the lip control and air stream, in order to bring certain notes into tune. There are also reports of the horn feeling a bit stuffy and not being as free blowing as a higher quality model. Consumers who are looking for a more reliable model and one that has a reputation for valve quality should check out the Allora MXPT 5801. It costs more, but is a bestselling model. The Allora 5801 has a lot more to offer in terms of sound and overall quality. What’s really left to say about a trumpet that has a faulty valve system and questionable accessories? This is one of Mendini’s top selling models simply because it’s offered at such a low price. And for families on a tight budget looking for a starter model that a young child can learn on, it may be the best bet. If you’re a music student or a pro, this model isn’t for you. It only makes sense if you’re in need of a low-priced pocket model that a young child or beginner can practice on, in order to determine if the trumpet is their instrument. If that describes your situation, it makes a good starter model that won’t break the bank. 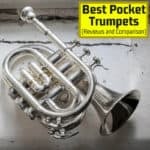 Consumers who purchased the Mendini MPTL Brass Bb Pocket Trumpet gave it a rating of three and a half out of five stars for the included accessories, design, color options and warranty. We concur and give it a Musicaroo rating of 3.9 out of 5.